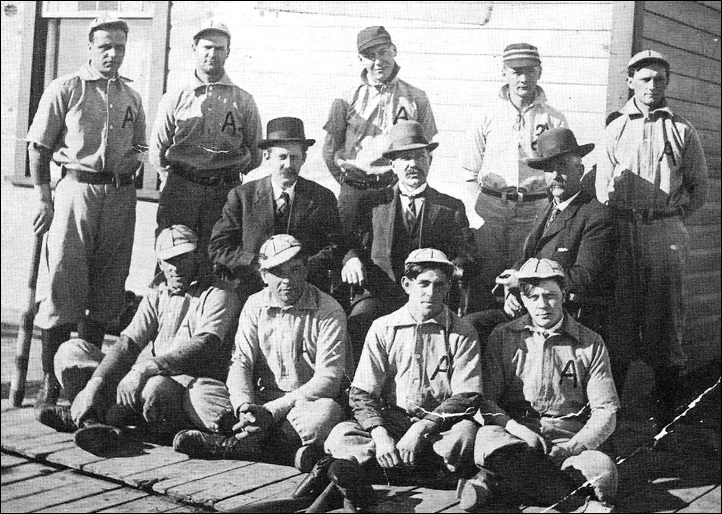 The Aberdeen, Saskatchewan, ball team of 1909. Back row - station agent Hern, livery man Dailey, two hired players, Peck and Jerry, Jack Mowat's brother-in-law Billy Graham. Seated - manager, Mucluski, Sec., H. Schroeder, town policeman Brown. Seated front - Earl Lockridge, Albert Miller, A.N. Winters, J.H. Bigelow.